COMPANY PROFILE China Everbright Bank Co Ltd is engaged in the provisioning of corporate and retail deposits, loans and advances, settlement, treasury business and other financial services as approved by the China Banking Regulatory Commission. China Everbright Bank Co Ltd is a full-service bank with operations mostly in mainland China. It has been increasingly present in parts of Asia, including Hong Kong and South Korea, and on the Internet through its online and mobile platforms. A core part of its business model is the large-asset concept offered to corporate clients, which integrates traditional credit resources with investment banking, inter-banking, asset management, and the leasing business. Most of the bank’s income is generated through net interest income, followed by fees and commissions. A majority of its interest-earning assets are in loans and advances, and loans to the manufacturing, real estate, and wholesale and retail trade industries constitute the largest portions of the bank’s loan portfolio. At the price of CNY3.56 as at 07 Aug 2018, China Everbright Bank Co Ltd is trading at a Price to Book Ratio of 0.6 times current book value. 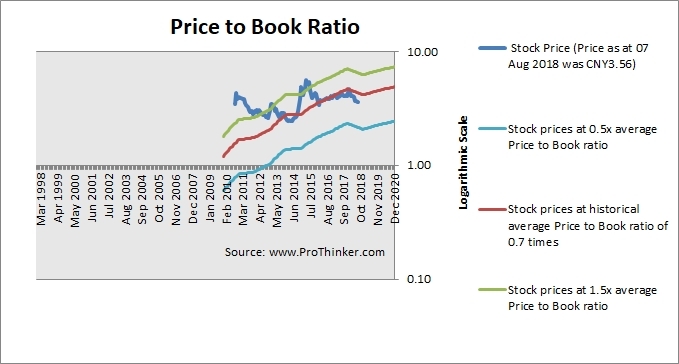 This is a 18% discount to its historical average Price to Book Ratio of 0.7 times.